Why the cost of Chinese logistics is more than many developed countries? According to one report from KPMG in 2012, the logistics cost occupies around 18% in the whole GDP, which is much more than many developed countries. The tax problem. The tax rates between the service industry and logistics industry are different. The verification of the sum of the invoice of the companies is based on quantity of the vehicles and other fixed assets which is unfavorable to the logistics enterprises. The fuel costs rise frequently that increases the cost pressure of the short-distance transport business city distribution business. The pontage and toll fee charge the transportation business a lot. The cost of human power is getting higher and higher. The management of the company it self also brings the problem of the increased costs. The whole logistic industry is in a low standard. That means lots of the private company even some personal vehicle contract for the transportation without any management. The industry structure in China is different from it in developed countries. Now the industry structure is still ordered as the industry, service, and agriculture while in developed countries the order is service, industry and agriculture. So the countries with the first industry of service get the less costs logistics costs than China with the first industry of industry. In summary, the Chinese logistics industry is still on the way to develop more. We need more and more professional logistics personnel to improve this situation, to make the logistics industry more perfect. With the technology development, the needs of the electronics products increase more and more. As we all know, the electronic products are always updated and replaced by the next generation so fast. So the life of one product is shorter compared with other products normally. I always changed my cell phone around 2 years, and the laptop also can be used around 5years not because of the poor quality, but due to the new requirements of the some software or operation system appearing, the old one can hardly meet the need any more. Consequently, lots of the rubbish including the broken computers, printers, communication equipment, household electrical appliances or the electronic instrument is left. This kind of rubbish is called E-waste, will be very harmful to the human health, while it also contains lots of the elements like metal, plastic which could be recycled for use. Then the reverse logistics of the E-waste appeared in order to solve the E waste pollution. Many companies start to establish the reverse logistics system not only for protecting the environment but also they can get considerable benefits from it. Recycling: this is the basic function of the reverse logistics; the cost of recycling is a big part of the whole logistics system. 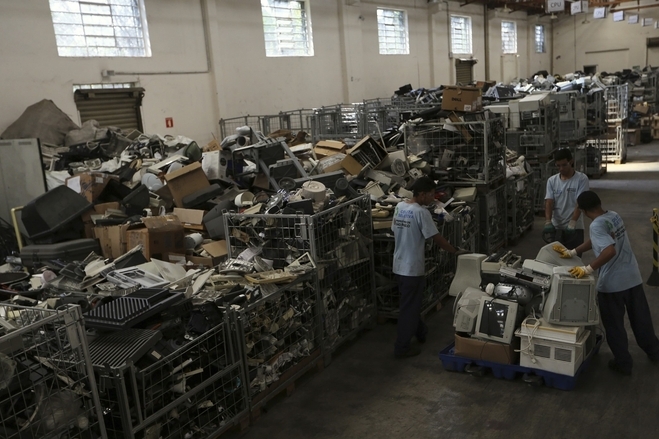 Collecting the E-waste from the different places, with less amount increase the difficulty of transportation. Detect and dismantle: this step is the key to determine if the waste could be reused and through which way can be reused. During the process, the rubbish can be recognized more early to save the transportation cost. Reprocessing: the waste which can be reused will be reprocessed. The way including reusing, reproducing and recycling. Reusing means the waste can be used again only by being cleaned or being repaired a little directly. Reproducing means keeping the main structure and function of the waste, by replacing and detecting some parts to produce a new one. Recycling means only collecting the useful metal, crystal or plastics from the waste by dismantling the waste. Resale: selling the recycled products including sale, transportation and warehousing. This process is similar to the normal logistics system. Nowadays, many western countries have formulated strict regulations regarding with the recycling E-waste while in China we still do not have the related regulations although we already become a big electronic product consumed country. 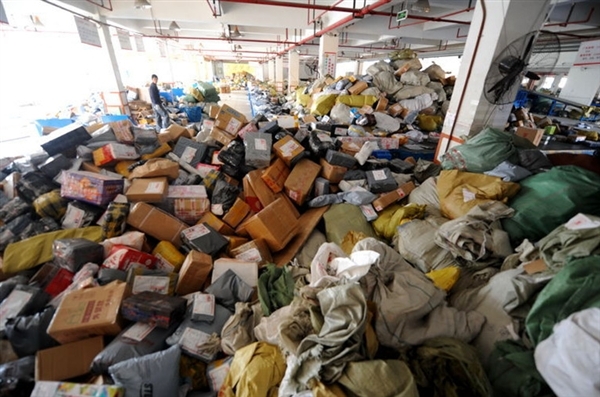 I think the reverse logistics system of the E-waste should not only be paid attention by the government, but also it should be implemented from the enterprises themselves. The government could introduce some policies to protect or compensate to encourage those companies. 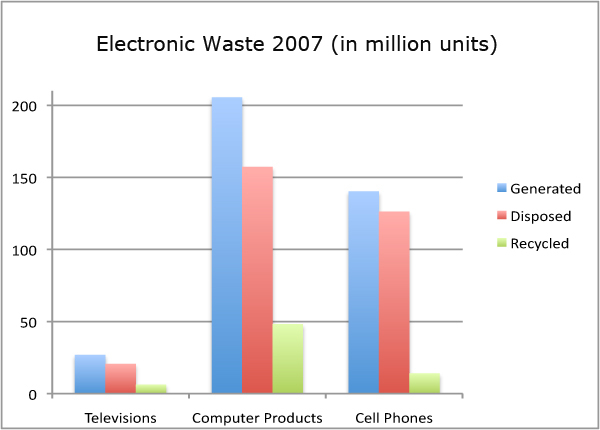 And the people also should become more aware of the E-waste recycling. Consequently, our society could be made better and better in the future. I am so lazy to go out for shopping sometimes. And thanks for the online shopping, almost every time I need something, I will buy it by the online shopping. You can find so many different online shopping website in China. It saves you the time and more money. Even when I am in Spain, I am still interested in shopping something through this way. But do you ever think about it, how could the online shopping service survive without the logistics support behind? Surely by the electronic commerce industry, the logistics industry develops more rapidly. Especially in China, more and more people are interested in shopping through the internet. Thus, there appeared lots of the courier companies. According to the statistics in 2013 from China Federation of Logistics & Purchasing, the companies have more than half business of this courier service which also bring them amount of benefits. So I think in the future the Chinese courier industry will have the four trends: more popularized, more professional, more facilitation and more internationalized. Firstly, compared with the physical shop, there are two basic advantages of online shopping which are cheapness and products variety. Now, we have around 600millions internet users, and among them there are 400 millions users have the experiences of online shopping while there are more than 140 millions of them do online shopping at least one time per month. The age of users are presented younger and younger. The young users are very fond of hearing the courier knocking the door and delivering the thing which they have bought. As the time goes on, with no doubt, online shopping will be an entire –citizen commercial behaviors in China. Therefore, the courier industry will also boom stably. Secondly, although the most obvious character of the courier service is “ FAST “, with the development of the service in all the industries, the courier consists more meanings. Customers not only require the packages arrive in time, but also the different delivery way, the safety of the packages, etc. All of these needs will require this industry become more professional. Thirdly, there should be more convenience. As the one of the service industry, courier service should provide more and more new service to meet the basic needs as well as some extra, not only the online shopping business, but also entering the daily life more. For example, now there appeared one new service is delivering the dirty clothes of the students who live in the campus to their home for washing and deliver them back. Last, the internationalization makes the world smaller, and the same time creates more opportunities for the courier service. Some courier companies of China is already expanding there market abroad. To adapt different environment, culture, to meet different needs is the way to keep the company developing sustainably. Here is a very interesting video about the research of E-Commerce in China. The professor arranged a tour to the big Spanish company Poecelanosa. It was a really very meaningful trip which gave us a lot of lessons about many aspects such like the production quality management, logistics management, security management, green production management, innovation management and market management. Porcelanosa is a Spanish ceramics and tiling company that specializes in bathroom furniture and accessories and tiling. It has many branches in the United Kingdom, Spain, France, Italy, Mexico, the United States and across the world. It was founded in 1973 in Villarreal, staffed by 98 employees. The company specializes in the production of porous, stoneware and porcelain wall and floor tiles in various finishes. First of all, as the leading ceramics products company in the Spanish manufacture industry, they do a very well production quality management, the whole process from the choosing the raw material to manufacturing the semifinal or the final products, they use a strict production process way and advanced machine to promoting the efficiency and more accurate. Besides, although most of the processes are implanted by the automatic machine, but a appropriate number of workers are arranged by the side of the machine in case some thing wrong or errors happen occasionally to assure more quality of the products. Secondly, when the bus got close to the company, the thing first came into your view was the huge logistics center logo and the building itself. They have one of the biggest logistics centers in Spain which includes one of the largest automatic warehouses in the world with a total storage capacity of 275,000 automatic pallets, the new construction will pair on 10 automatic bilateral stacker cranes with 20 shelving units, each 525 feet long. The 35,000 square foot warehouse extension was constructed 105 feet high and 913 feet long, roughly the size of a 10-story building, and has a storage capacity for 65,300 pallets. And as we have seen that during the whole storage process, there are few workers working with the forklift for moving some pallets of the product for distribution. The logistics system is highly automated. Thirdly, a good manufacture enterprise always has a good security management, Porcelanosa does, too. All the workers also are dressed the uniforms and the safety shoes to protect the body. Additionally, in their huge factory, the floor is always kept clean although special ceramics production produces the dust or other dirt very often. Some automatic machine work without the operators, cleaning the workshop area more than 12 hours everyday which protect the whole environment inside the factory, preventing the workers from the respiratory diseases. You cannot imagine that it is so hard to find the dust even in some places it should exist that impressed us a lot. The thing more interested is that when the workers are asked about their health problem with working here, they told us that some of them got the respiratory diseases in the past years when the factory didn’t pay more attention about the security issue when it established in the beginning, but now fewer and fewer workers are sick because of the environment problem. Many workers have already worked here more than 20 years. Fourthly, the green production management is also well implemented. Due to the special products they manufacture, it should have caused some population. 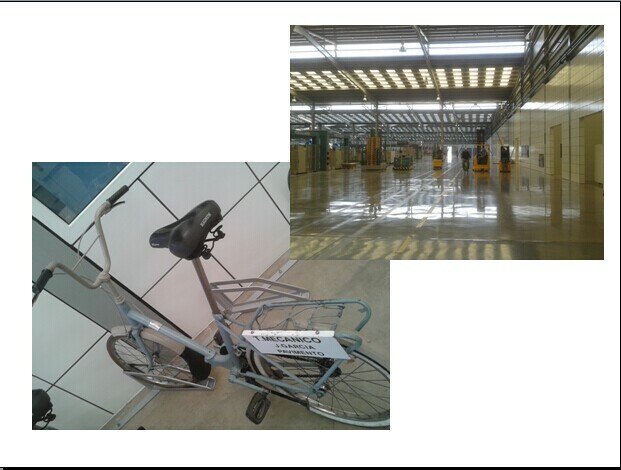 But you can see that in such a non-dust environment with a huge workshop inside the factory, the workers ride the bicycles to reach anywhere they want to go. Each bicycle is put in order in the parking places with the names of the workers. And although there a lot of the machine which produce a high heat for the production reason, we can hardly see the air conditioners interior the factory. It does not mean the company doesn’t provide a better working condition for the workers, instead, the top of the factory there are many windows in order which helps the ventilation. So you will ever feel so hot inside the factory. Regarding with the innovation management, they have an interior exposition which is called the products library storing thousands of the various products. Not only for researching the products catalog, but also searching some products information, it really helps a lot. Besides, those products samples also make the development of the innovation by the existed former products. Last but not least is the marketing management. The company cannot survive with only manufacturing the products. It is the marketing which produce the profits for the company. Except the factory, Porcelanosa also has one big exposition hall in the first floor of the office building. There are different styles of the kitchens or bathroom according the different zones on the earth. You will find the Asian style, Russian style, north European style, American style, etc. Customers can have a visit in the hall, consulting any products which they are interested. This makes the products more visually to present in front of the customers. Besides, in order to expand the influence of their products in the range of the whole world, they invite many socialites to publicize them, from the famous film stars in Hollywood, to the Prince Charles of the United Kingdoms. Porcelanosa is a successful enterprise from all of the view which we have seen through the visit. But of course they still have to improve to challenge the future fierce competitive market. We need different types of goods in our daily life. We may buy some of these items in bulk and store them in our house. Similarly, businessmen also need a variety of goods for their use. Some of them may not be available all the time. But they need those items throughout the year without any break. 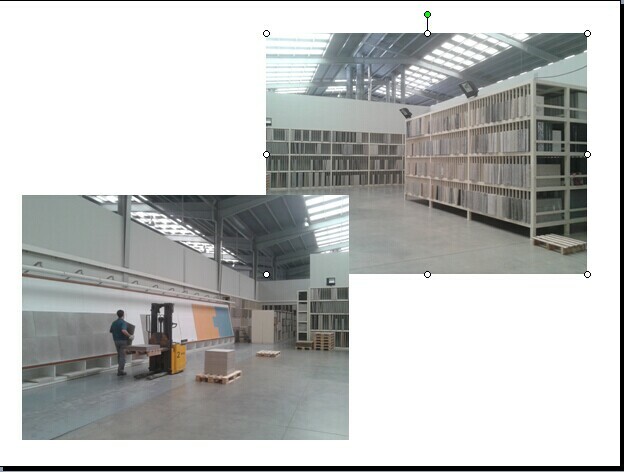 Therefore, the warehouse plays a more and more important role. Due to the development of technology, the warehouse becomes more and more modernized for meeting more requirements for the company. I was so lucky to have the chance to visit the logistics center of Consum Cooperativa which is a Spanish supermarket chain founded and headquartered in Valencia, Spain. 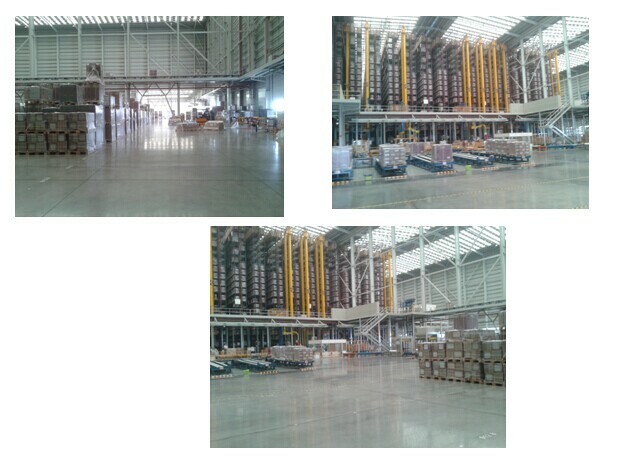 The Silla warehouse is the largest in Valencia, with 38,000m2, housing dry foods, fragrances, medicines, and various items. These items are divided mainly according to their frequency of need. The warehouse consists of four sections: two conventional sections, one for food and the other for non-food, one low-rotation area, and one high-rotation area. Among them, in the high-rotation, most of the equipment is so automated that there is few workers working there only for monitoring if there is some errors or not. I noticed that the since the goods arrive this area, it is put on the conveyor which consist several self-inspection area for checking if the pallet itself and if the goods is packed well or not, if not, the goods will be sent to some special area to be repacked. The goods will be delivered to a huge storing rack. 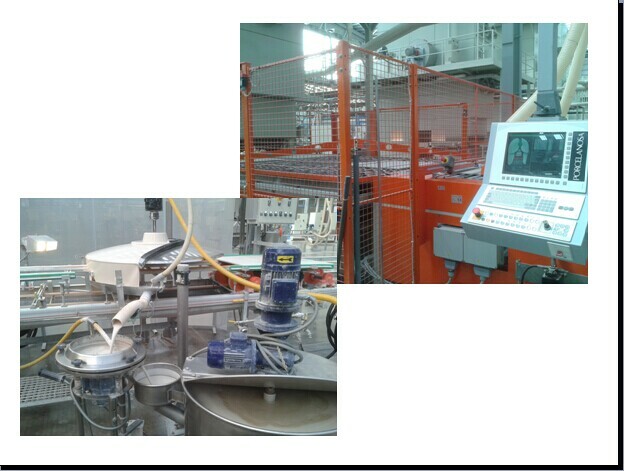 The whole process is totally automatically completed by the related equipment. The warehouse seems to be the most important part in the retail industry, but a manufacture enterprise also takes the warehouse as a key part of their whole business chain. Last week, we had an interesting and meaningful visit to Porcelanosa. It is a Spanish ceramics and tiling company that specializes in bathroom furniture and accessories and tiling. 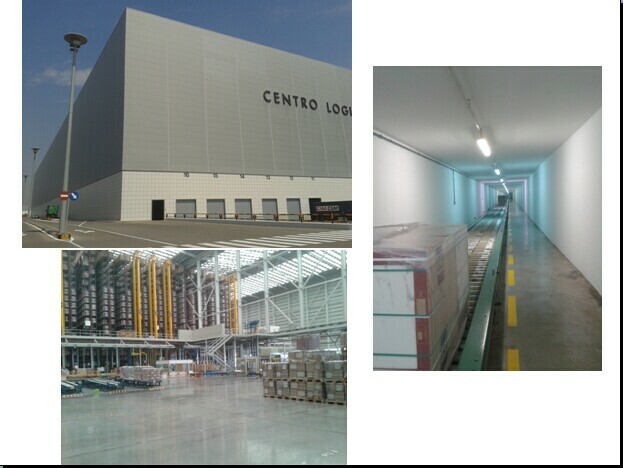 As the leader in their industry, they have one of the biggest logistics centers in Spain which includes one of the largest automatic warehouses in the world with a total storage capacity of 275,000 automatic pallets, the new construction will pair on 10 automatic bilateral stacker cranes with 20 shelving units, each 525 feet long. The 35,000 square foot warehouse extension was constructed 105 feet high and 913 feet long, roughly the size of a 10-story building, and has a storage capacity for 65,300 pallets. And as we have seen that during the whole storage process, the products are transferred by the conveyor automatically to the storage place, and there are only few workers working with the forklift for moving some pallets of the product for distribution. Everything is put in order. 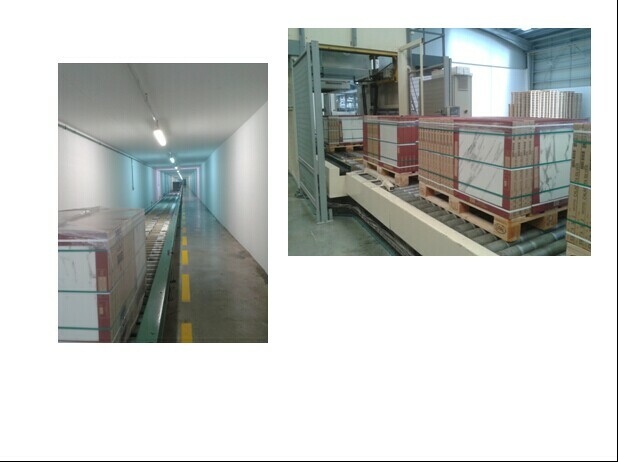 The warehouse are huge and very clean, the logistics system is highly automated. From the two cases, we can see the big enterprises pay more and more attention to build a highly modernized automated warehouse. A modernized, automated, with more area warehouse will be the final trend when the company wants to develop and expand. I chose to write about pallet pooling because it was my one slide topic a few weeks ago, but because of time issues in class I was not able to explain it. What I found most interesting in pallet pooling was that it seems to be of utmost efficiency in saving time, money and resources. 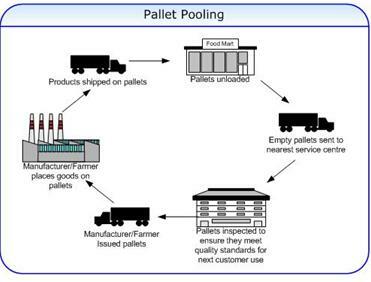 Pallet pooling is the use of the same pallets in a “network of customers in various markets, for the storage and transportation of their products” (Demes Logistics, 2004). The cycle begins with manufactures or their customers leasing pallets from a third-party pallet leasing company; products are then placed on these pallets and are transferred throughout the supply chain of a product. By pallet pooling, the manual handling of products is minimal. In some cases pallets are even used as part of in-store product storage and display. There are various advantages to pallet pooling starting out with eliminating the cost of purchasing pallets and storage space for pallets in warehouses. There are many other benefits that manufactures and customers have reported such as less damage to products and loss of pallets. Transportation costs are also reduced and there is better tracking of pallets and products. Perhaps one of the most important aspects of pallet pooling is that pallets are of better quality due to the fact that the leasing company takes care of inspecting, maintaining, and repairing them on a regular basis before they re-enter the system.